Make your alarm work like you want it to! Notifications: Be notified by text messages or email when your alarm detects trouble, armed, disarmed, or even detects a problem with your electrical or temperature control systems. Storage Building Protection: Extend your security to sheds and storage building. Starting at $149. Live operator Response: Speak with our dispatchers any time without picking up the phone. Starting as low as $3 per month. Open Door Alert: Worried about goods walking out the back door of your business? Be alerted (beeping keypad or silent text) when a certain door is opened (or left open too long) during normal operating hours. Web/Smartphone Remote Control: Control your alarm anywhere from a PC or smartphone: remotely arm or disarm your alarm, turn on the lights, control heating and air conditioning systems, unlock doors. Even watch security cameras. 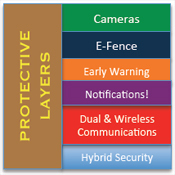 Protective Layers: Protective Layers is our most advanced security service. Protective Layers combines a number of our advanced systems and services that gives you a military like designed security system. This system can notify you the moment someone enters your property before they can reach anything to steal. As the trespasser moves closer to the structure an announcement is made warning them “the owners have be notified” and “we are remotely monitoring your activity”. We believe this confirms to a burglar: 1. We have a security system 2. Its working 3. We are watching you Meanwhile you have the ability to be remotely view who is at your property with the ability to take “snap shots” and email or text right from your smartphone. With advanced wireless communications you never have to worry about your phone line being cut. Keychain Remote (Keyfob): Add a keychain remote to arm or disarm the alarm, or send a silent panic alarm. Starting at $50. User Codes & Tracking: Ever wish you knew who armed/disarmed the alarm? Wish you knew: who forgot to arm the alarm back? Stuff out of place or missing and wonder: Who has been in here recently? Add multiple codes to your security system to track who is coming and going, and when. Nosey Monitoring: Each part of your alarm is broken into zones. Doors, windows, motion detectors, etc. make up zones on your alarm. Sometimes it would be helpful to know if a zone is activated. For example if someone goes into a certain room or opens a certain door. You can be notified of this by a beeping keypad or a silent text/email. 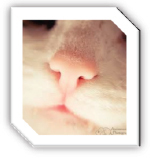 Pet Friendly Design: We love pets and understand pets are a apart of the family too. That’s why we offer systems with a Pet Friendly design. Ask one of our security specialist what devices work best for your family. Lighting Control: Activate and deactivate your lights on a schedule, from the web, or your smartphone app. You can even have they the security system control lights like activating all lights in the event of a fire to aid in an escape. 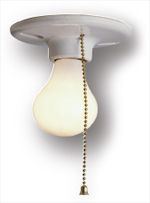 Appliance Control: Control power to small appliances, lamps and receptacles. Imagine a design that cuts power to bathroom receptacles upon arming the security system in “EXIT” mode. 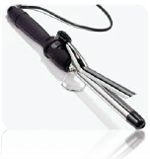 Killing power to bathroom Hot Irons or activates power to an appliance to begin dinner. HVAC Controls: Always be in control of your heating and air conditioning system. Control your air from the web/smartphone anywhere in the world. Set your system to a schedule to help reduce your energy cost. Security Cameras: Add the protection and peace of mind from seeing with your own eyes by adding security cameras to your security system. Starting as low as $99 installed and $10/mo. Partitioned Security: Turn your alarm into 2 (or more) systems: leave storage buildings armed even when your house is off; keep critical storage or office space as its own system. Carbon Monoxide Monitoring: With monitored CO detectors, we alert you to an unsafe CO condition any time. Water Detection: Do you worry that a pipe may leak or drain will become clogged allowing water to backup to unsafe levels? Prevent severe water damage with water detection. Hold-Up/Panic Alarm: Adding the protection of a stationary or wireless portable panic alarm will allow you to silently signal for help. Upon receiving your signal we dispatch immediately. Available in several models from necklace type, watch style, wheel chair/Walker strap, under the counter mount and specialty mounting devices. Pool Gate monitoring: Receive notification on your keypad, text, or email when a gate is opened or left open too long. 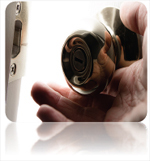 Lock Controls: Lock and unlock doors from your PC or smart phone. Forget about ever needing keys and paying locksmith fees again… change your door code anytime you want. Have different codes for each users. Emergency Communicator: Press a button and talk to a live operator response in case of emergency for the elderly or physically disabled. Great for bedside or bathroom. Broadband Alarm Monitoring: Forget the phone: use your internet connection to deliver lightning-fast response. This connection provides fast delivery of signals and an app for smartphone controls. Starting as low as $31.95/mo. Cellular Alarm Monitoring: You’re thinking of cutting the cord on your home phone service, everyone already calls your cell. The thing is you want to keep your alarm monitored. Installing a cellular connection to your alarm frees it from the need for a traditional phone line because now its 100% wireless communications. And that 100% wireless communications means there are no lines to cut that would disable communications. In addition most cellular plans offer interactive services allowing you to control your alarm and more from anywhere in the world. Buzz’em In: Do you have a door that needs a button to “Buzz’em In”? One button allows visitors in, keeps hoodlums out. Card/fob Swipe Door Access: Swipe a fob/card to unlock a door and gain access. No keys needed. Each time a fob/card is swiped the date, time and who used the fob is recorded. A fob/card can be disabled or set to an access schedule. Clubhouse Swipe Entry: We have systems to allow swipe access to workout rooms, bathrooms, clubhouses, and pool entry gates. Deny access for those behind in their fees or restrict access to certain times of the day and year. Know who used the facility and when. Out of routine monitoring: Do you have a loved one you worry about? Would it be helpful to get a message that your loved one has not been moving about their home by a certain time? For example its 9 am and no one has been up moving in the house? Then Out of routine monitoring is right for you. Failed to Open/Close: Does your business open late or do your employees close up early? Not opening and closing on time can cause you to miss business and loose money. Don’t miss business and loose money, let us alert you when the business has not opened on time or closes up early. Out of schedule opening: How would you feel if an employee entered your business after hours or on weekends when the business is closed? Maybe its necessary business or maybe its something you should know about. We can tell you if your business is opened outside the normal schedule with out of schedule monitoring.